Cornerback Brandon Hughes underwent surgery on his broken hand and is out indefinitely according to the Eagles, who basically have just five healthy corners. Cornerback Curtis Marsh is out with a broken hand. Eagles cannot afford to lose Boykin. Eagles head coach Chip Kelly and defensive coordinator Billy Davis don't need to expose starters Cary Williams and Bradley Fletcher to injury. But one of them may have to play in the preseason finale Thursday against the Jets at the Meadowlands. The same with nickel back Brandon Boykin. Rookie seventh-round pick Jordan Poyer and Trevard Lindley are all that remains of the position. Offensive lineman Dennis Kelly remains sidelined after lower back surgery. The good news is Bryce Brown was able to practice after twisting his ankle in the Monday practice at Lincoln Financial Field. 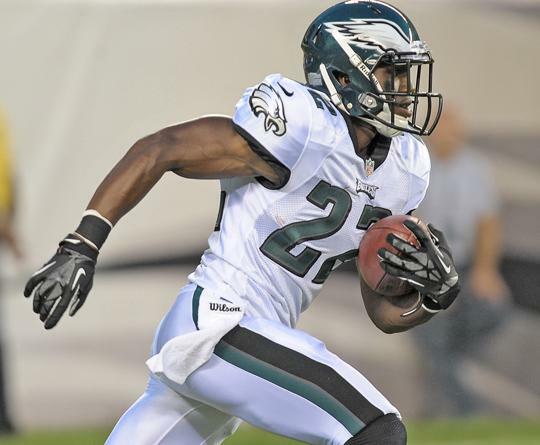 Eagles head coach Chip Kelly noted that Brown returned to that practice. "He's good," Kelly said. "I didn't get any reports from our trainers that there were any issues." The Eagles obviously are looking for help at cornerback. Chip Kelly on sideline signs: "Next question"